February is almost over, don’t miss your chance to see special events at the Rock and Roll Hall of Fame. All this month, the Rock Hall focusses on African-American musical artists of the past and present. Come see free performances by local and national musicians, film screenings lectures and much more! 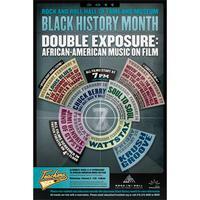 This month features a special film series “Double Exposure: African-American Music on Film,” highlighting the role of African-Americans in the history and development of rock and roll. Musicians featured include Jimi Hendrix, Chuck Berry, Curtis Mayfield, The Staples Singers, Run-D.M.C., Ike & Tina Turner, Wilson Pickett, and Isaac Hayes. This month also has special events for the kids including Rockin’ the Schools and Alternate Takes: K-12 Approaches to African-American Music on Film. Don’t miss your chance to experience this special event!